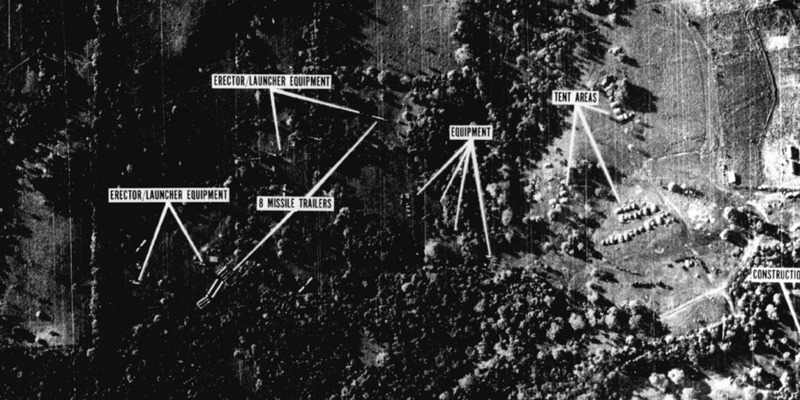 JFK LibrarySoviet missiles in Cuba, seen in reconnaissance photos taken on October 14, 1962. On October 14, 1962, one of the US Air Force’s vaunted U-2 spy planes soared over Cuba. The photos it took during that high-altitude pass revealed the assembly of Soviet SS-4 medium-range ballistic missiles. To that point, Soviet nuclear weapons were vastly outnumbered by US nuclear weapons. 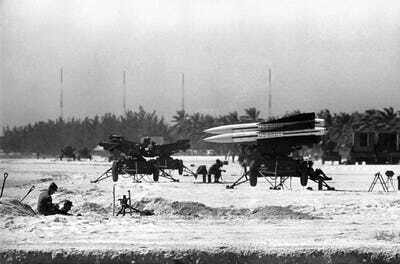 But Soviet missiles parked in Cuba could reach most of the US within minutes. For President John F. Kennedy, less than a year and half from the disastrous Bay of Pigs invasion, staring down the business end of Soviet missiles was unacceptable. 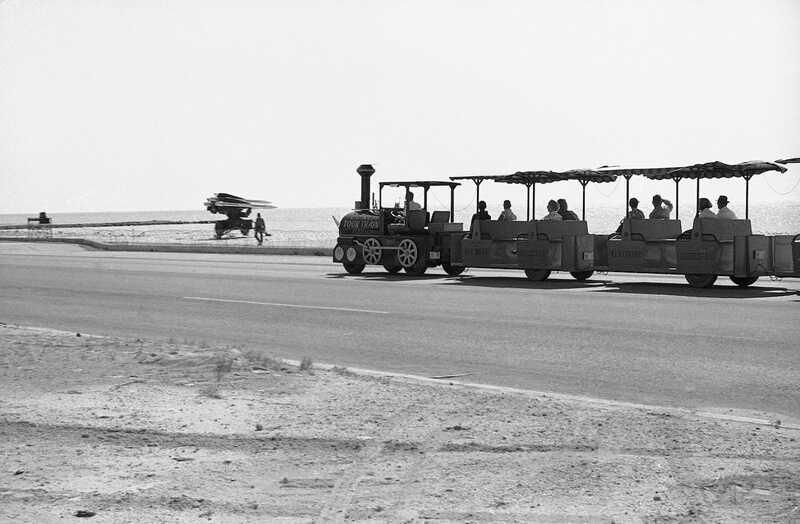 For 13 long days in October 1962, the world waited to see who would blink first. Here’s what that looked like on the beaches of Florida, just 90 miles from the beginning of the end of the world. President John F. Kennedy as he appeared on TV, October 22, 1962, informing the US public of his decision to set up a naval “quarantine” of Cuba. 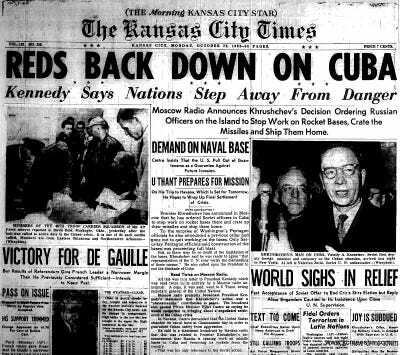 Kennedy’s remarks, televised that evening, echoed the Monroe Doctrine, according to the State Department’s official history. Cuban leader Fidel Castro responded to Kennedy’s decision to set up a blockade over Cuban radio and television on October 23, 1962. Pickets representing an organisation known as Women Strike for Peace carry placards outside UN headquarters in New York City, October 23, 1962. 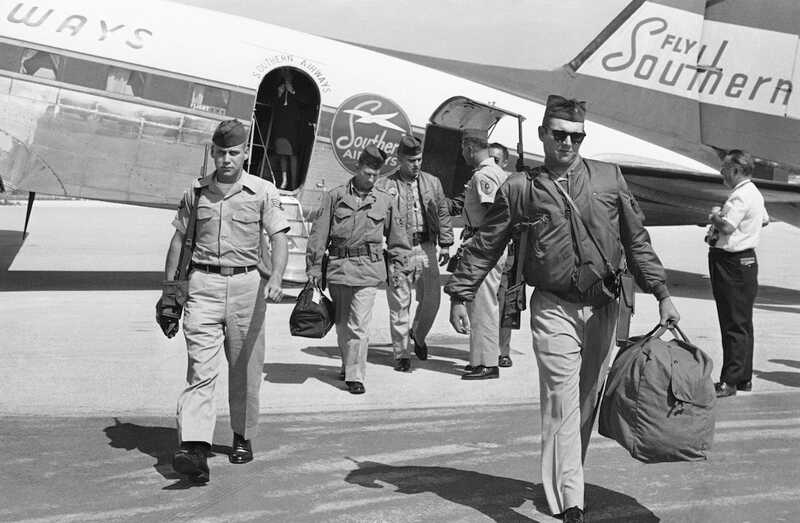 Members of a 14-man detachment of air police exit a Southern Airways plane at the Key West International Airport, October 24, 1962. The detachment was from Seymour Johnson Air Force Base near Goldsboro, North Carolina. Two women watch US soldiers setting up anti-aircraft missile launchers on a beach in Key West, Florida, October 26, 1962. 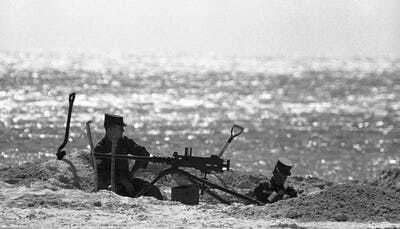 The Army took over a large section of public beach named after US Senator George A. Smathers. Smathers, a dedicated Cold Warrior, served two terms in the US House of Representatives and three terms in the Senate. He was also close to Kennedy, speaking at his wedding rehearsal dinner, and to Richard Nixon, to whom Smathers sold his home in Key Biscayne, Florida. Two kids watch a US soldier make adjustments on anti-aircraft missile equipment set up on a public beach at Key West, Florida, October 26, 1962. 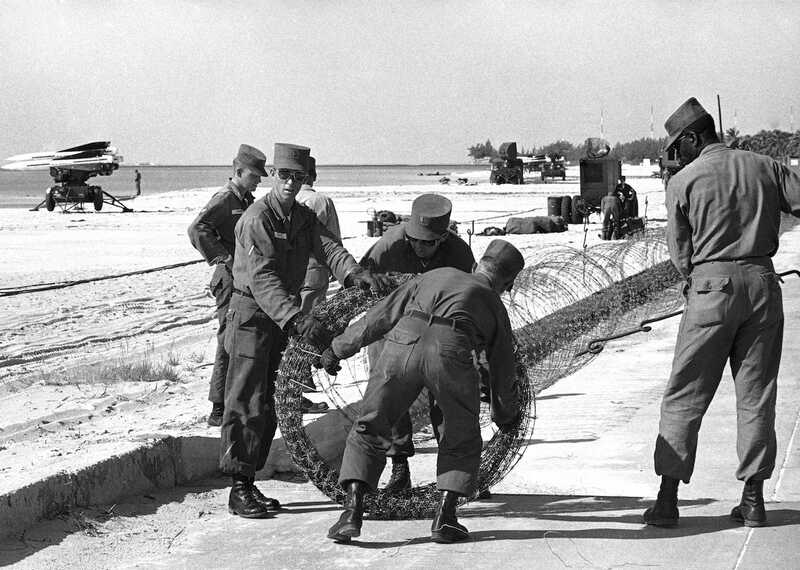 The Army obtained permission from the City of Key West to use the beach for the installation. 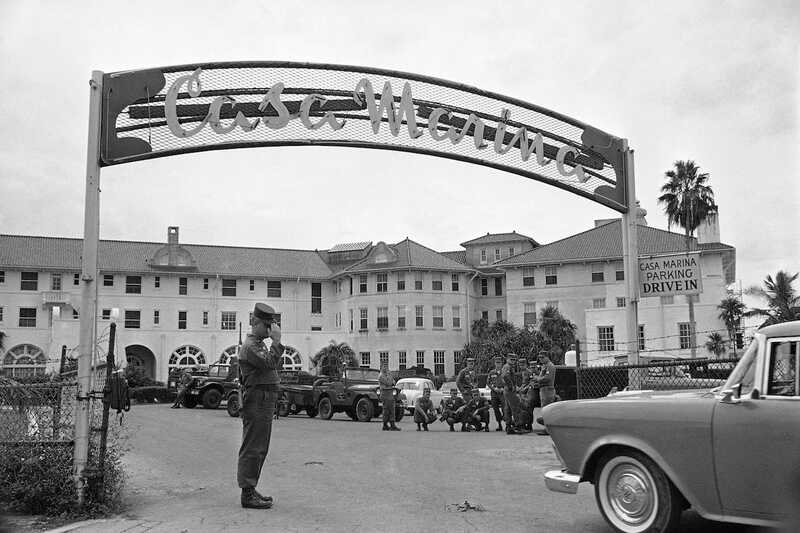 A sentry salutes an incoming car at the gate of the Casa Marina resort hotel in Key West, Florida, which is occupied by US troops who moved into the city, October 26, 1962. During World War II the hotel was used to billet Navy officers. Two soldiers sit in a machine-gun emplacement beside anti-aircraft rocket positions on a beach at Key West, Florida, October 27, 1962. 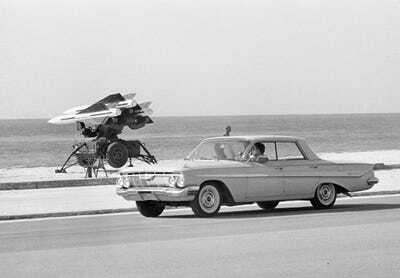 US Army anti-aircraft rockets mounted on launchers and pointed out over the Florida Straits in full view in Key West, Florida, October 27, 1962. 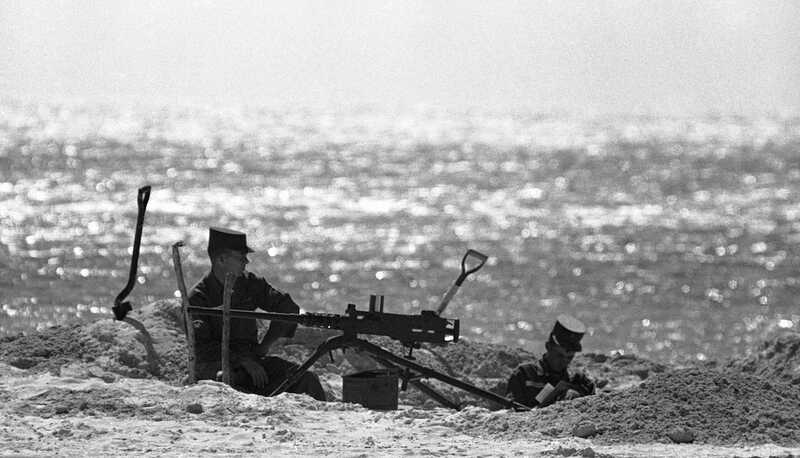 Two soldiers sit in a sandy dugout beside a machine-gun position on a beach at Key West, Florida, October 27, 1962. 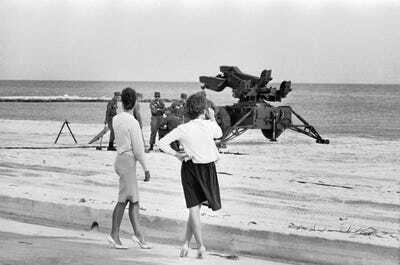 Key West sightseers have an extra attraction on a tour of the beach facing Havana, November 1, 1962. US troops string barbed wire along the Key West shore facing Havana, November 1, 1962. 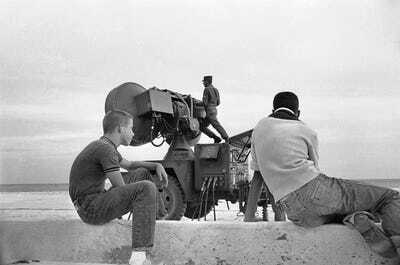 Military installations, rushed in during the Cuban missile crisis, line the beach in the background. 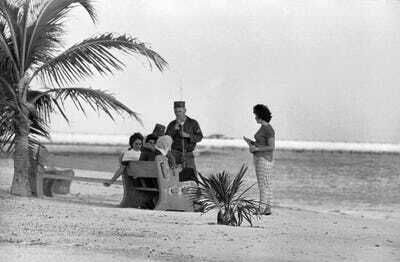 Soldiers on their first day off-duty since their arrival seem to be enjoying themselves, fish or no fish, in Key West, Florida, November 4, 1962. 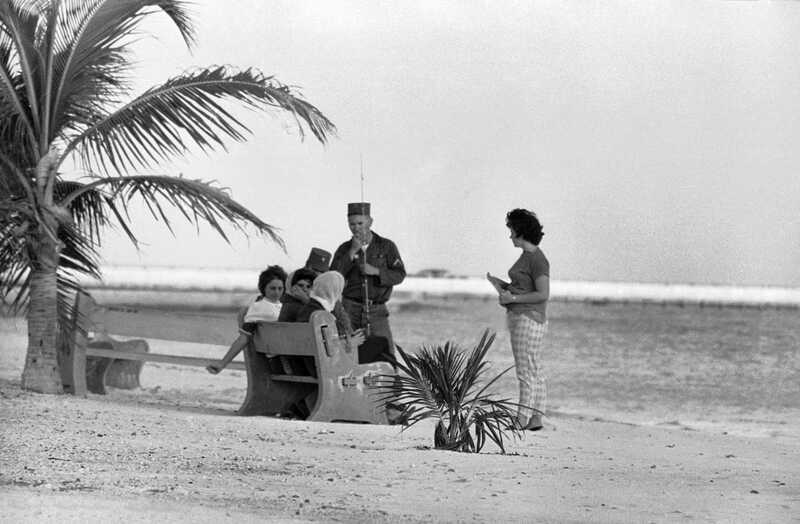 Soldiers manning Army installations on the barricaded beach may look relaxed to the tourists driving along the road, but they are on the alert for anything that comes along in Key West, November 5, 1962. In a message on October 26, Khrushchev said the Soviet Union would remove the missiles if the US promised not to invade Cuba. The next day, he sent another message saying the USSR would remove the missiles if the US removed its missiles in Turkey. 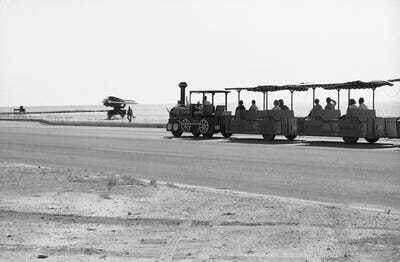 The US publicly accepted the first offer. But privately it agreed to the terms of the second. Robert Kennedy, the attorney general, delivered the message to the Soviet Embassy, and the crisis drew down on October 28. Also on the October 27, another U-2 was shot down over Cuba, leading US officials to brace for an attack if a diplomatic resolution couldn’t be reached. The naval blockade continued until the Soviet Union agreed to remove its Il-28 bombers from Cuba. The blockade was removed on November 20. 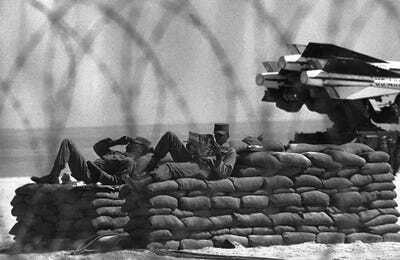 The following April, the US removed its Jupiter missiles from Turkey.